Mobile Internet applications run on devices such as smartphones and tablets, and have dramatically changed the landscape of applicationgenerated network traffic. The potent combination of millions of such applications and the instant accessibility of high-speed Internet on mobile devices through 3G and now LTE technology has also changed how users themselves interact with the Internet. 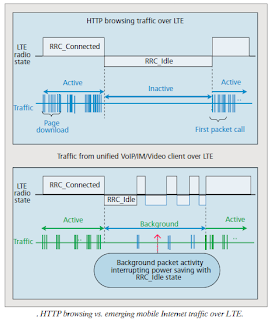 Specifically, the radio states in LTE such as RRC_Connected and RRC_Idle were designed with more traditional applications such as web browsing and FTP in mind. These traditional applications typically generated traffic only during Active (Connected) state, and once the user session ended, usually the traffic ended too, thus allowing the radio to move to Inactive (Idle) state. However, newer applications such as Facebook and Twitter generate a constant stream of autonomous and/or user generated traffic at all times, thus erasing the previously clear demarcation between Active and Inactive states. This means a given mobile device (or user equipment, in LTE parlance) often ends up moving between Connected and Idle states frequently to send mostly short bursts of data, draining device battery and causing excessive signaling overhead in LTE networks. This problem has grown and attracted the research community’s attention to address the negative effects of frequent back and forth transitions between LTE radio states. In this article, the traffic characteristics of these emerging mobile Internet applications is first explored and how they differ from more traditional applications. Investigation their impact on LTE device power and air interface signaling is also presented. A presentation of a survey of state-of-the-art solutions proposed in literature to address the problems, and analysis of their merits and demerits is done. Lastly, a discussion of the solutions adopted by 3GPP including the latest developments in Release 11 to handle these issues, and present potential future research directions in this field is also made.